It’s been a long time since I sent out my previous newsletter in mid-February. That doesn’t mean I’ve been inactive—quite the contrary, I’ve just been too busy to document all the things I’ve been doing or to compile the list of important links and resources I want you to know about. This edition is intended to remedy that. I returned to the U.S. from Asia in mid-February for a four month stint, but am now back in Thailand for an indefinite period. While in America, much of my time and energy was taken up with preparing and delivering some new presentations, providing media interviews, and trying in vain to keep up with email and other correspondence. The first few weeks in Tucson were devoted to resting up, reconnecting with friends and colleagues, and taking care of some personal business details. By the middle of April, I had completed a new presentation which elaborates the themes that I began expounding more than a year ago about societal metamorphosis and the “Butterfly economy,” and added more material about “new finance” to my perennial topic of alternative exchange. Long-time friend and associate, Les Squires, made it possible for me to venture up to Colorado for a few days in April to conduct a series of presentations, discussions, and consultations. Highlights of that trip included my presentation titled, Money and Finance in the Emerging Butterfly Economy, which I delivered to the Highland City Club in Boulder, and another presentation on The Butterfly Economy at the Louisville Public Library. These were co-sponsored by various Transitions groups and individuals and will eventually be made available on my website http://beyondmoney.net. I had a rewarding but exhausting trip back east in May, with family visits sandwiched in between presentations in Florida and Toronto. The first of these was a workshop that I was asked to provide for members of the Financial Planning Association at their annual retreat. I titled it, Financial Planning in the Emerging Butterfly Economy: Realities, Trends and Discontinuities. You can view the power point slide show at https://beyondmoney.files.wordpress.com/2011/07/greco-fpa-powerpointrevpost.pps. I have a recording of my narrative which I would like to combine with the slide show but I’ll need some help to do that. If anyone has the skills and the time to work with me on that, I’d greatly appreciate it. The hardest part was the last 4 days in Toronto where I gave a lecture at the MINT film festival on the first day, two TV interviews on the second, and workshops on the third and fourth days, with a lot of consultations in between. That trip was hosted by Glen Alan who, as the new director, has put renewed vigor into the Toronto Dollar currency project. Glen, who happens to be a musician and operates a professional recording studio, is well-connected, very effective, and a fountain of energy. All of the Toronto proceedings were professionally recorded and are in the process of being edited. Glen and Ron Elmy are putting together a DVD that will be available from The MINT Film Festival website in less than a month. Watch for it on http://mintff.org. You can download a short video teaser now at http://www.ronelmy.com/files/thg.zip. Already posted are my interview with Frank Touby (at http://www.youtube.com/watch?v=vvCruoYcN4Q), and my interview with Hugh Reilly (at http://www.youtube.com/watch?v=s7nOYCRHjOY&feature=player_detailpage). My particular vision, interests and expertise are, I think, fairly well expressed in these interviews. I’m hopeful that my Toronto visit and the follow-up activities will have a far reaching positive impact. Sometime toward the end of last year I mentioned an exciting new project called, CREW, the purpose of which is to provide a perpetual pool of capital to finance both for-profit and non-profit enterprises that help to create resilient, sustainable communities. It is one instance of an emerging phenomenon called crowd sourcing or crowd funding. CREW is not intended to provide any direct personal gain. Money we put in is not a loan, nor is it an ownership share, but a gift that is intended to be a permanent investment in the common good. I have great expectations for this initiative, and as a member of the CREW Founder’s Circle, I invite you to join my CREW. We will together decide how the funds in our joint stewardship account will be invested. Just go to http://www.CREWfund.org/tomg, watch the short video, and click on the orange Join Now button. For those of you who do not regularly follow my posts, I’d like to highlight a few especially important ones. You can be notified of new posts by following me (tomazgreco) on Twitter. The war against the middle class. It is ever more apparent that there is a deliberate policy to impoverish and disempower the middle class. As far back as 2006, billionaire Warren Buffet was quoted in the New York Times as saying, “There’s class warfare, all right, but it’s my class, the rich class, that’s making war, and we’re winning.” More recently, Senator Bernie Sanders, in a speech to his Senate colleagues, plainly described the war that is being waged against the middle class by the super-wealthy elite and their minions in Congress. Find it at this post, https://beyondmoney.net/2011/03/28/what-happened-to-class-war-in-america/, and search “Sanders” on my site for additional material on the subject. This is not simply an American war, but one that is being waged globally, as we see from the austerity that is being imposed on Ireland, Greece, and other “developed” coutries. One aspect of that war is the ongoing shifting of the tax burden from corporations and wealthy individuals onto the backs of the poor and middle-class. Former Labor Secretary Robert Reich explains that part of it in a 2 minute video. See it at, https://beyondmoney.net/2011/06/20/the-truth-about-the-economy/. Community. The answer to that situation lies in mobilizing our energies and resources to build community. See my post on that at, https://beyondmoney.net/2011/04/29/coping-caring-and-building-community/. Libya. Regarding the ongoing assault by NATO forces against Libya, there is no doubt a hidden agenda. Hmm, what might that be? See my posts at https://beyondmoney.net/2011/04/07/what-is-the-truth-about-libya/ and https://beyondmoney.net/2011/04/08/money-and-oil-the-agenda-in-libya-becomes-more-evident/. Cashless Exchange Coming of Age. And here’s an important article I wrote in response to a request from Green America that was posted on their Green America Exchange blog. It describes what I see as the necessary conditions for the cashless exchange revolution to go viral. My article, Stop Chasing the Buck and Change Your Luck, can be found here: https://beyondmoney.net/2011/04/04/stop-chasing-the-buck-and-change-your-luck/. Inflation. About the inflation threat, you should read this, https://beyondmoney.net/2011/03/29/fed-buying-bonds-hyper-inflation-on-the-way/. I’ve written a new article, Reclaiming the Credit Commons, the Key to a Peaceful and Happy Society, that will be included in an anthology tentatively titled, Self-Sustaining Abundance: The Commons, Beyond Market and State. The book project is being supported by The Heinrich Boell Foundation of Germany, and is being co-edited by Silke Helfrich and David Bollier. It will be published early next year in English, German and Spanish. One of my published articles will be included in the upcoming anthology What Comes After Money? which will be published later this year by Evolver Editions (http://www.evolvereditions.com) in partnership with North Atlantic Books, and will be distributed by Random House. 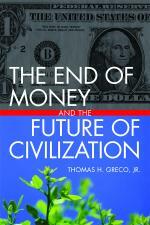 The Chinese translation of my book, The End of Money and the Future of Civilization, is now in print. Next time you think life is hard, remember Nick. I’m reassessing how I want to spend my time and energy from here on out. I’d like to be a little less busy, and direct the bulk of my attention to aspects of my work that are most creative, enjoyable, and effective. I’ll be cutting back on correspondence and lecturing, and emphasizing consultations and collaborations with groups and individuals working on projects that show promise of making major breakthroughs toward interest-free cashless trading, equitable finance, and economic democracy. This entry was posted in My activities and tagged butterfly economy, class war, CREW, inflation, MINT film festival, the butterfly society, Toronto. Bookmark the permalink.